Today I read this post by Ann Voskamp and I am wrecked. Sitting in my living room, looking out as the sun falls through the window, a soft breeze blowing through the leaves just outside. The irony of my current experience versus what I am reading about around the world is not lost on me. Polar opposites of the spectrum. Angry tears fall as I sit with this new information. I think about conversations that I’ve heard lately. Debates going on in our culture and in our Christian circles. Complaints of discrimination, even persecution. And part of me is tired of talking about cakes and business owners, guns and government, alcohol and modesty. I know these topics can be important. I know there is a place. But I will not live and die on the hill of these issues. For just a moment, can we stop the words, thoughts, and opinions about all of this, and instead lift our eyes to what is happening around the world? Can we take a moment to consider the girls who are being raped, the families displaced, those who seek refuge and a chance to live? Can we have prayer meetings and weep and talk around our kitchen tables over ways we can help others who are just trying to survive? Can we give up our coffee or wine, or maybe a dinner out this week, and instead donate it to someone whose life has been completely turned upside down? Who has lost a husband, child, home, or any semblance of normalcy? I know the terrorists overseas seem powerful, their actions overwhelming. And it can seem like the easiest thing to do is to return to my own business, my own little world. But this is exactly what they’re banking on and believing that we’ll do. That we Americans will pay them little attention. That maybe there will be some social media outcry, but that it will quickly die down. They’re waiting for us to go back to our favorite television shows, our activities, our lives. After all, we often offer lip service but rarely anything more. Our attention spans are trained to quickly move to the next thing. Today we stop. Today we pray. Today we give until it hurts. Today we sit with the pain of what we’ve read. Today we don’t turn away. Today we tell our children of the atrocity others are facing and we allow ourselves to break, just a little bit. Or maybe a lot. We sit at the dinner table or at bedtime and ask our kids to join us as we pray, as we give, to join us as we break for others. We teach them to listen to the heartbreak that is happening. We teach them to love. And then we act. And we teach our children to do the same. We stop conversations about vaccines and celebrities and who loves who and who deserves our help and how we feel we’re being ostracized in our culture. And instead we focus on the things that truly matter. Hope. Love. The chance at life. A pouring out. No more taking in. Not today. Today we give to someone else. Today we do something. And this action will not end with us. Because today we teach our children to do the same. After I wrote this post, I sat with my anger and helplessness and like many others cried out to God. The amazing thing about God? He heard -- not only my prayer, but the prayers of thousands more. I watched as friends and family, as well as people I did not know, began to share Ann's blog post. I saw people helping and praying and then asking others to join them. I saw other bloggers and writers and even the women of the IF: Gathering highlight this issue, imploring people to help. I saw hope rising: In the form of prayer. In the form of funds. In the form of public outcry. God began to move. In us. And through us. Which is how God so often chooses to work. And so on Sunday morning, with no service to attend, we gathered our children in the living room. And I told them about what had happened this week. I told them about the people who are in desperate need of help. I remind them of Esther and how God often asks us to have regard for the poor, for those without a voice. And that, as a family, we choose to give. And we pray. And then I tell my kids to look up. 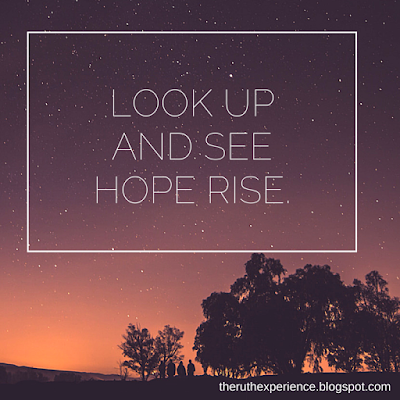 And to see hope rise. Maybe this is you today, friend. Maybe you've been asking God why. Maybe you're in need of a little hope, rising. Can I tell you, friend? It does and it will. Sometimes it takes a little longer than we'd like. But hang on, it'll come. We'd love to join with you while you wait. Comment below or message us; we'd love to pray with you. Today we are linking up with Holley Gerth and Jennifer Dukes Lee. Kerri Jo, I'm so glad you found us today! Everybody needs a little hope now and then, praying for you! Blessings.